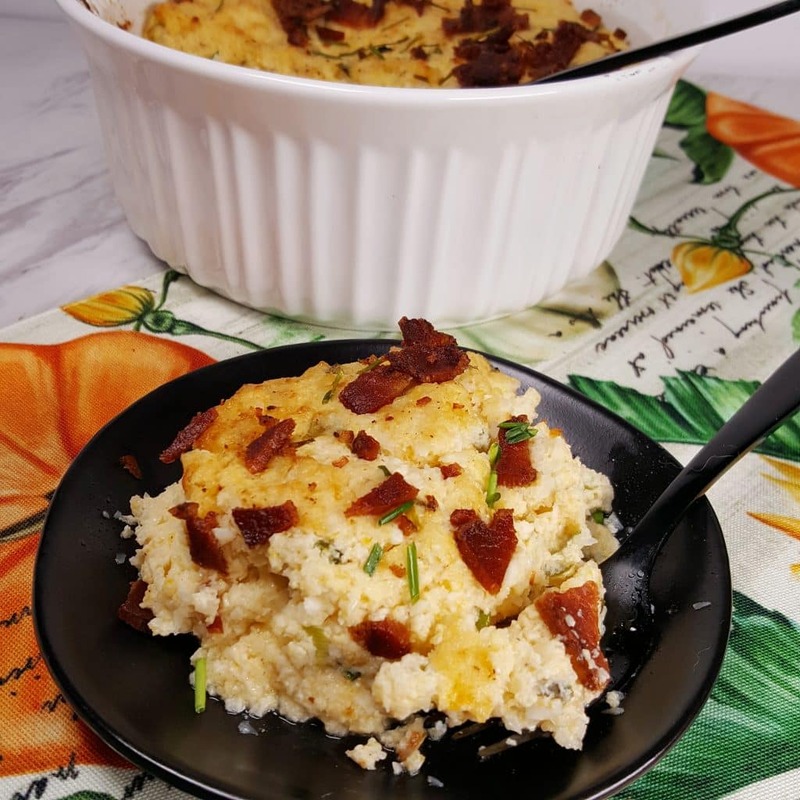 Pressure Cooker Cauliflower Soufflé is a simple Low Carb, Low Calorie, Keto side dish, which is delightfully cheesy and totally delicious. You won’t miss your Mashed Potatoes! Pressure Cooker Cauliflower Soufflé is a Low Carb, Keto version of my Dad’s Famous Potatoes Don Leonardo. They are similar to my Pressure Cooker Creamy Mashed Potatoes recipe, but, puff up like a Soufflé. My Dad hosted the best dinner parties, with the best food. As I am now eating a Low Carb-ish, Keto-ish diet, I will be converting all of my families favorite recipes. 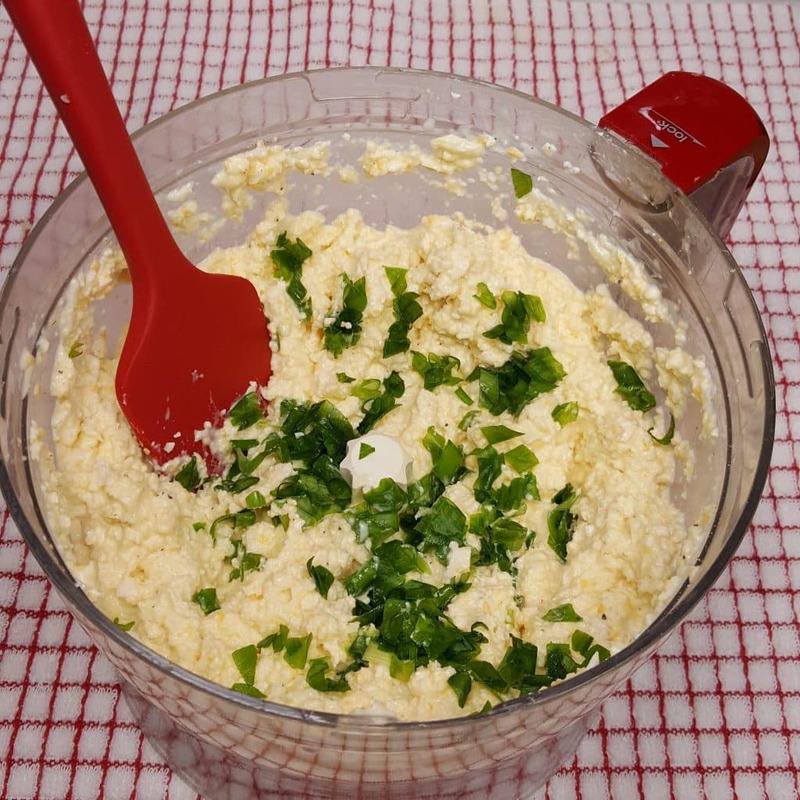 What I love about this recipe is that it is very easy to change up. For instance, feel like adding a bit of spice and Turmeric Powder? Just add it in. 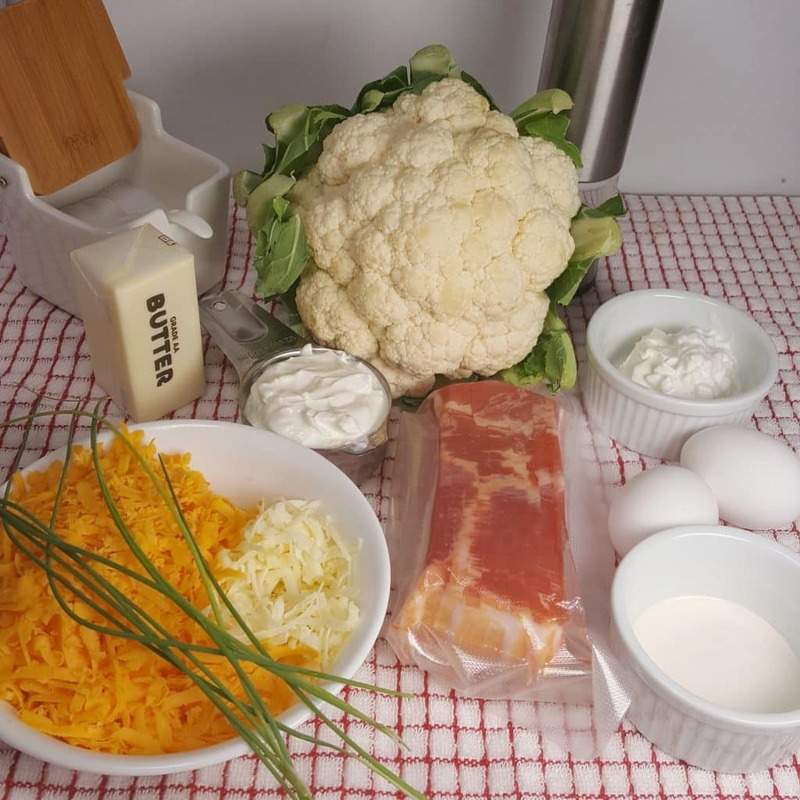 Another Cauliflower recipe to try is my Pressure Cooker Mashed Turmeric Cauliflower. Feeling a bit spicy? 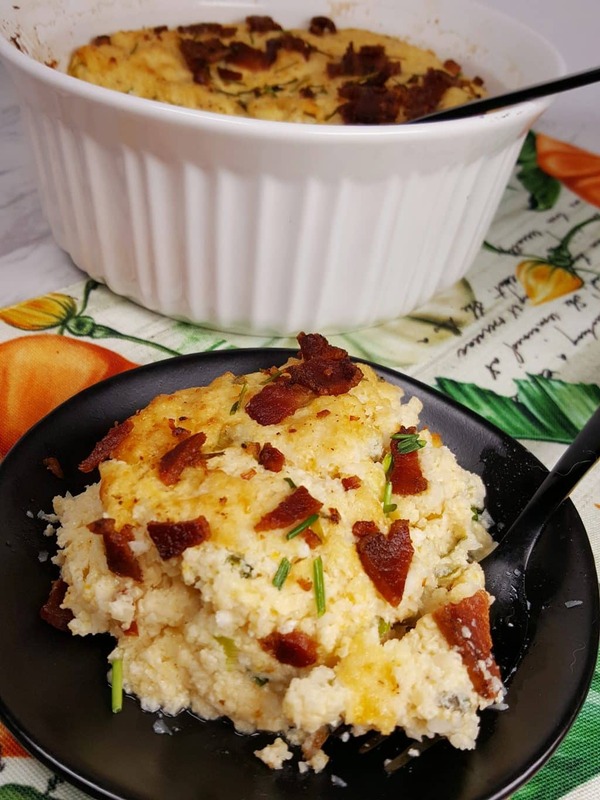 Add some Cajun seasonings for a Cajun Pressure Cooker Cauliflower Soufflé. As this is a Souffle and it needs to rise, you will want to mix it up really well. I use my large Food Processor. A Vitamix will work even better, assuming you want a smoother result. 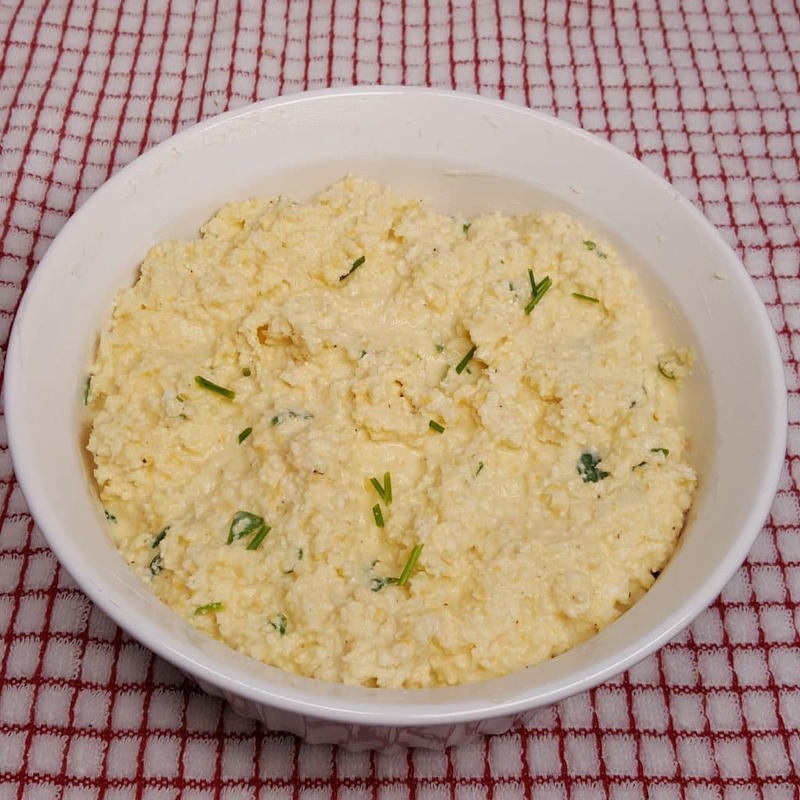 Whip the Eggs and a bunch of the ingredients up, so that the mix is nice and frothy. 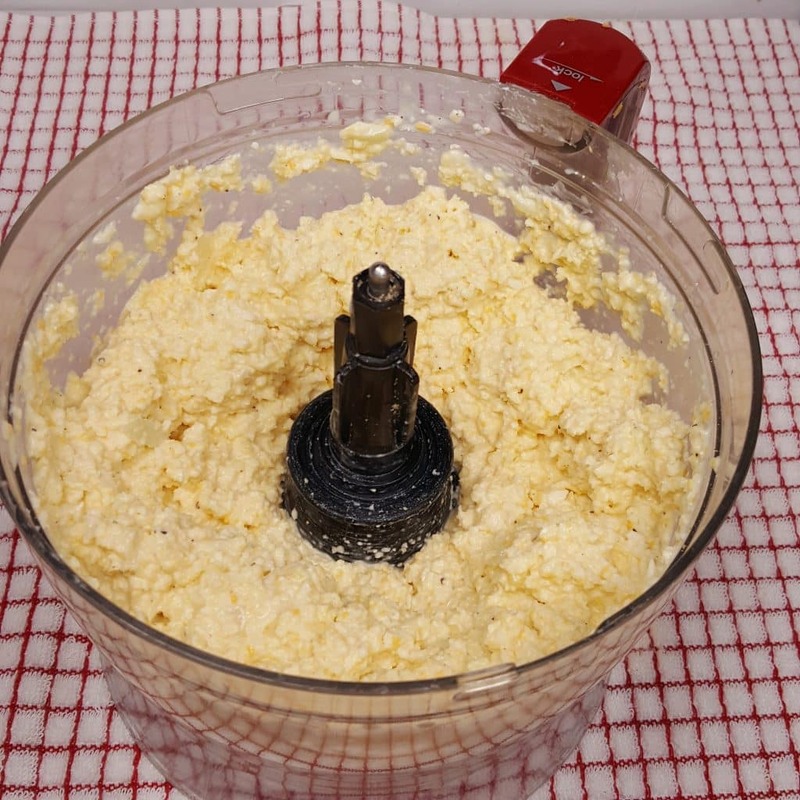 Get the eggs nice and Frothy and the cheese nicely blended. Chopping Cauliflower can be messy. 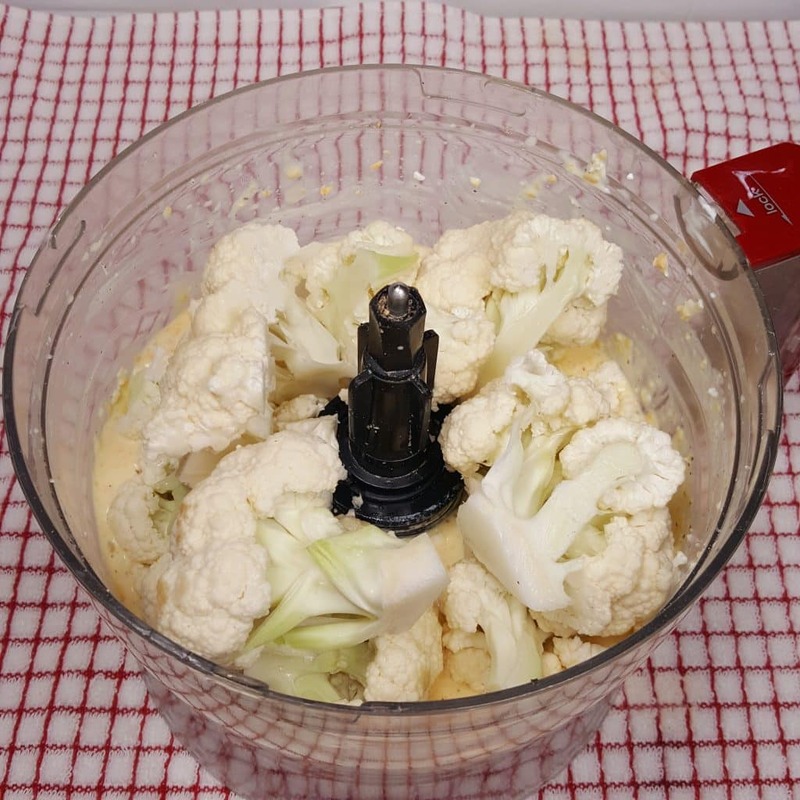 This neat little Chef’n Stalk Chop Cauliflower Prep Tool makes things easier. It’s really silly, but for under $6 bucks, it makes my life easier. Grind up the Cauliflower very well. It will be grainy in the Food Processor. The Vitamix will break it down more, so the texture is however you prefer. Smooth or chunky….like peanut butter. Remove the blade from your Food Processor. Fold in the Freeze Dried Chives. If you like a stronger onion flavor, add some Fresh Scallions too. 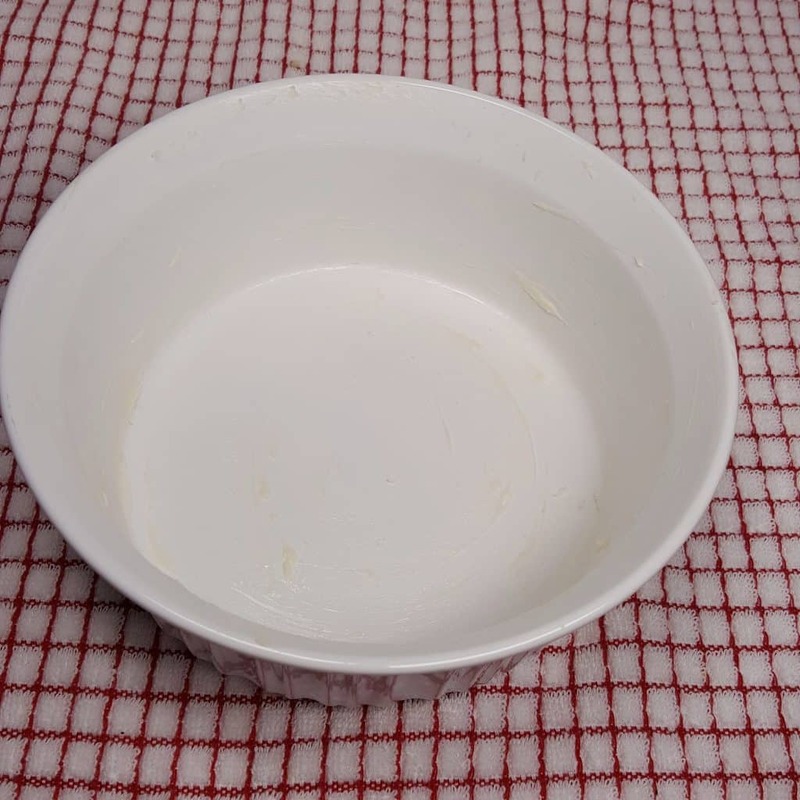 I love this French White Casserole Dish so much, as it works well in the Pressure Cooker and makes a nice presentation at the dinner table. Eggs love to stick to things. When making my Pressure Cooker Egg Loaf, it is so important to really grease the pan well. Add the Cauliflower mixture to the buttered Casserole Dish. Make sure not to pack it down. Since this Pressure Cooker Cauliflower Soufflé is being cooked in a Casserole Dish, we will use the Pot in Pot Method. The Pot in Pot “PIP” method is when you use a cooking vessel inside of the cooking pot. Whenever you use the PIP method, there should always be liquid in the cooking pot, so that the Instant Pot / Pressure Cooker will come up to Pressure. A Stainless Steel Trivet is use for PIP cooking. Many of my recipes use PIP cooking, with the main course beneath the Trivet. For example, my Instant Pot Indian Butter Chicken has the meat in the bottom and the rice on the top for a Pot in Pot, One Pot Meal! If you want to make, for example, my Pressure Cooker Japanese Beef Curry recipe for the main course with this Souffle, just use the PIP method. In this instance, the liquid from the Stew is enough, so no additional liquid needs to be use. A perfect Pot in Pot pairing for this Pressure Cooker Cauliflower Soufflé recipe is my Pressure Cooker Beef Stew with Root Vegetables recipe. 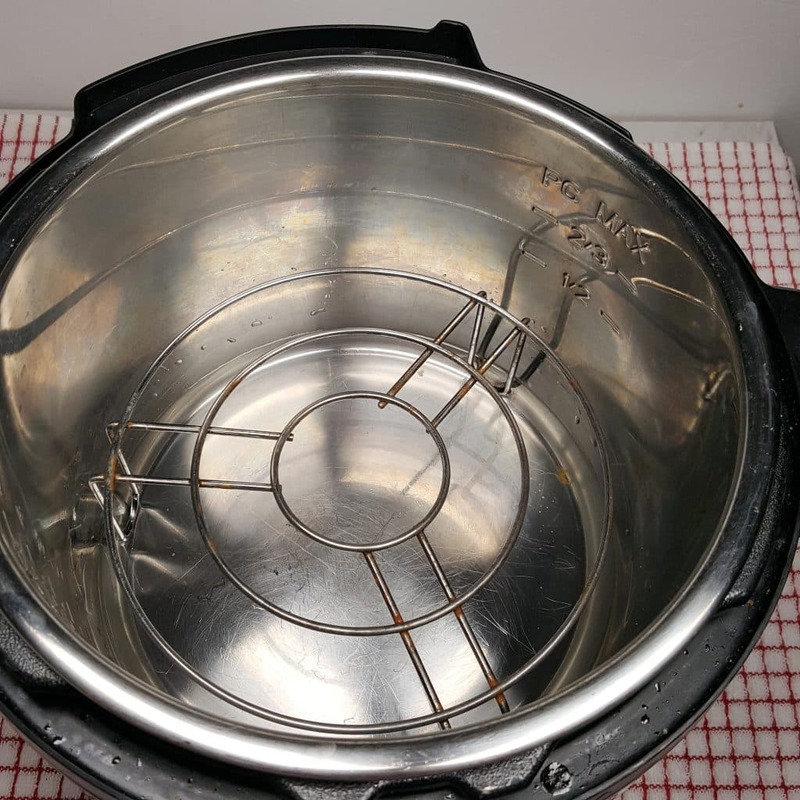 If your Trivet does not have handles, you might want to make a Foil Sling, so that you can easily lower and then remove the Casserole Dish from the Instant Pot. Top with More Cheese, Chives and Bacon! 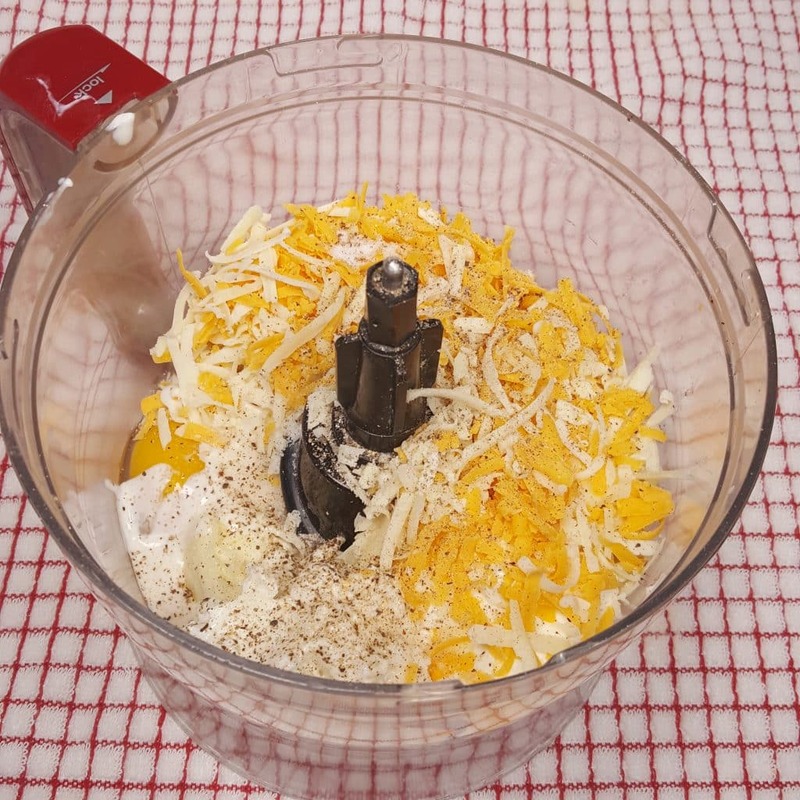 If you want a Cheesier Soufflé, top with more Shredded Cheese. The Cheese will melt from the heat, but a quick minute in the Air Fryer will give you a nice and crispy, cheesy crust! Crisp Bacon and Chives liven up the flavor, so that you have a party in your mouth. Any excess water, will absorb into the Soufflé after it has been sitting a while. A beautiful presentation to serve with any meal. For another delicious Low Carb recipe, try my Pressure Cooker Bruschetta Chicken with Zoodles. Remove green parts and core Cauliflower. Cut into chunks. 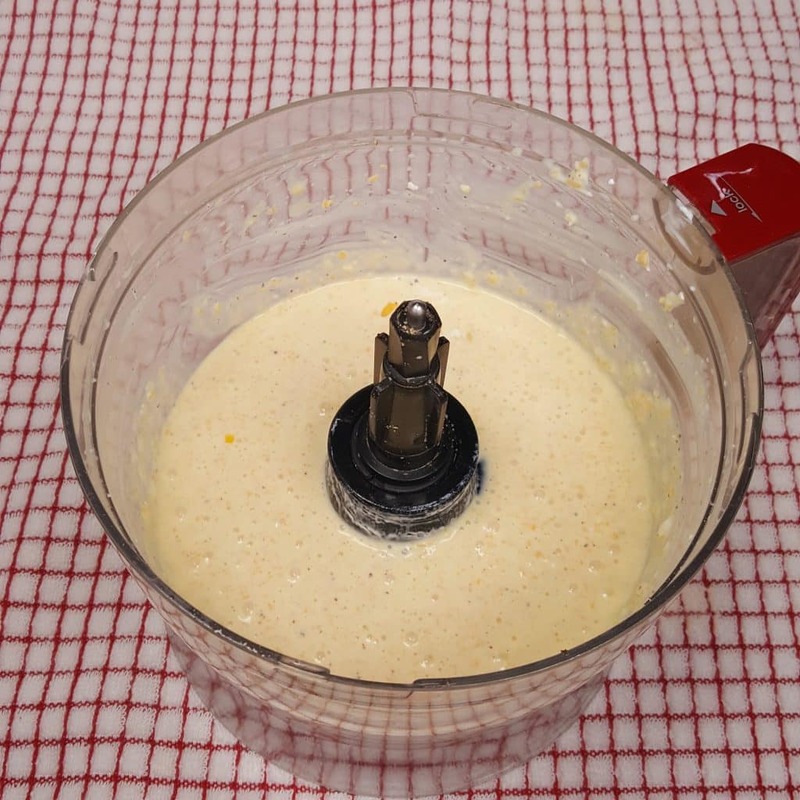 Add Eggs, Butter, Cream, Cream Cheese, Sour Cream, Asiago, Cheddar Cheese, Salt and Pepper to a Food Processor and process until smooth and frothy. Add Cauliflower and pulse until well blended. Remove Blade and fold in Chives. Add 1 cup of water to Pressure Cooker cooking pot and place a Trivet. Place Casserole Dish onto Trivet. Lock on lid and close Pressure Valve. Cook at High Pressure for 15 minutes. When Beep sounds, wait 10 minutes and then release pressure. 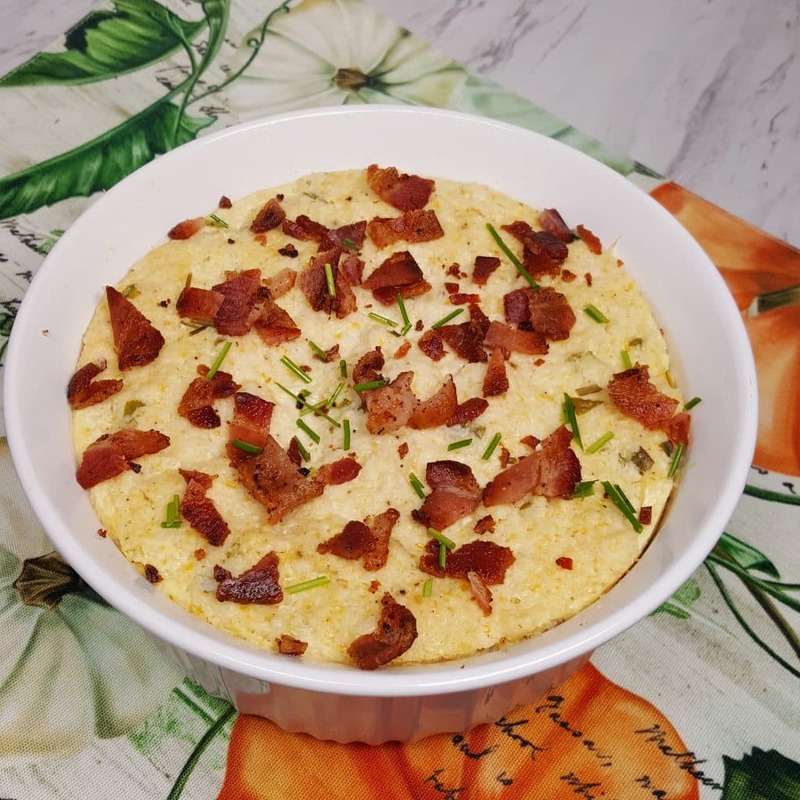 Top with more Cheese, Fresh Chives and Crumbled Bacon. Can this recipe be cooked in a Pyrex bowl rather than a soufflé dish? No blender here. What about a hand mixer to whisk/fluff ingredients? What are the dimensions of your corningware casserole dish. Easy and quick! Especially if you don’t use the bacon! This looks wonderful! I love cauliflower. I have a stovetop pressure cooker. Would I use the same time? I’ve never turned off the heat and let it set before I release pressure. Would I just release pressure at that time of turning off as it takes some time to release? Thank you! I haven’t tried it, but I bet you could use the fresh riced cauliflower that you can buy in the produce section. I think if you used the frozen kind, you would have too much liquid after it thaws to make the recipe work. I used a bag of riced cauliflower I had stored in the freezer (from Trader Joe’s produce section). I left it on the counter for 15 min. to break it up a bit. I added it to the blender ingredients at the prescribed time. Came out great! I’m adding the recipe to my tried and true collection! Did I miss the point value for the freestyle ww.w program? 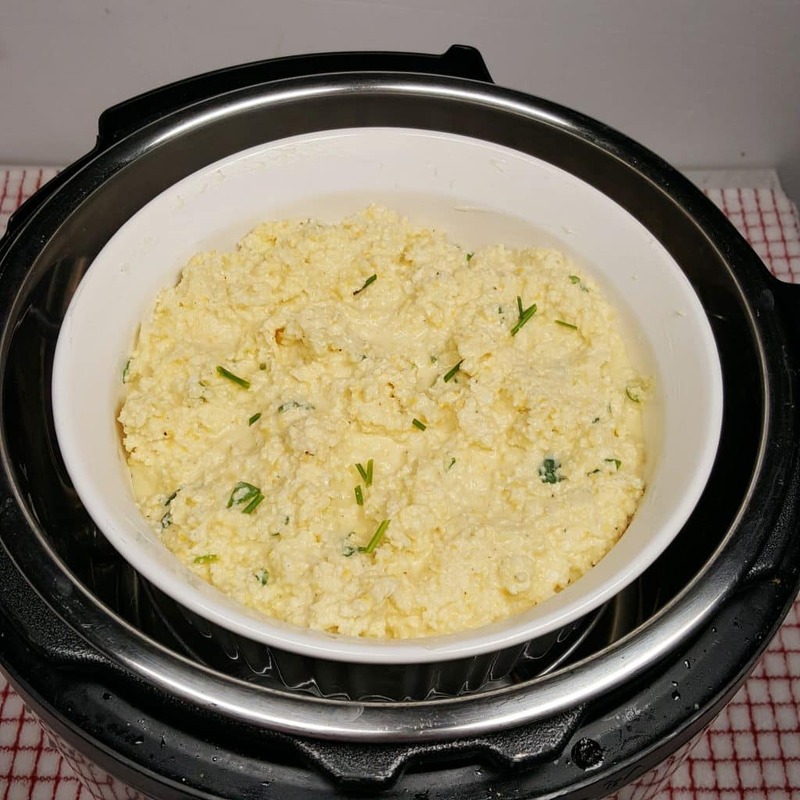 Can your Pressure Cooker Cauliflower Souffle’ be frozen? This looks good but I wanted the Dad’s famous Don Leonardo Potatoes but when I clicked on the link I got the 404 error. I am dying to try this. What size casserole do you use?? I clicked on the one that you have listed and the manufacturer does not recommend using in an IP. So, can you please clarify?? I really, really really want to make this!!! !